"The added protein from black beans adds a fibre boost and also allows you to use less ground chicken in this budget conscious variation on the traditional taco supper." Meanwhile, brown the chicken with the onion, green pepper, corn, chili powder, cumin, salt and pepper in a large, deep nonstick skillet set over medium-high heat. Add the salsa, black beans, and broth to the skillet. Bring to a boil; simmer for 10 minutes. Stir in the cooked noodles until coated. 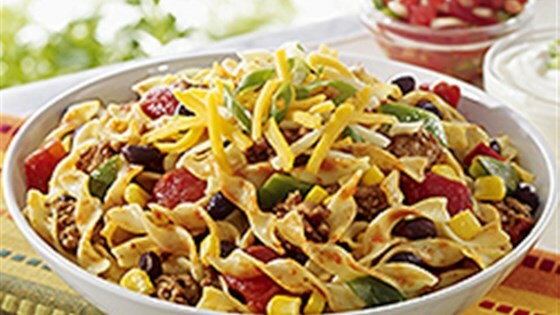 Serve with shredded Cheddar cheese, green onions, sour cream and additional salsa to garnish individual bowls at the table. Substitute extra lean ground beef for the chicken. For a spicier dish, use hot salsa and add hot sauce or hot pepper flakes to taste. Replace the chili powder and cumin with 4 teaspoon (20 mL) taco seasoning. Made with a mix of beans since the grocery store has no black beans but I am sure it made no difference. Great week day meal. Made this for 10 servings and everyone wanted seconds! Just the right amount of spices to this healthy meal! yummy. you could also substitute rice. I didn't have any salsa so I used a can of rotel tomatoes and green chilis with some taco sauce and it turned out great. Really good but a little spicy from the chili powder. Will cut it in half next time. Used an entire can of beans and half a can of corn.